The poet John Betjeman once observed in a BBC radio broadcast that his poems were not intended for clever people. Rather, he suggested, they are jingles for those enslaved to their own passions. Some churches are like that. Mortlock says of St Mary, Badley, that it seduces the senses, and sticks like a burr in the memory. Even Cautley's stiff upper lip wobbled briefly. But to get to this church, you must find it first. Only Depden is more hidden. No road goes within a mile of St Mary, and only by a sign to a track across the fields on the busy Needham Market to Stowmarket road would you ever know it was there. The track is driveable, although too potholed to make cycling a pleasure. It winds lazily through gentle rises for a mile or so, and the noise of the modern world is soon lost behind you. eventually, a cluster of buildings appear below. It is a lost valley; a large 16th century farm house and outbuildings, with the red brick church tower in front of it. Beyond, a hazy maze of trees and fields. No other building is in sight. It is utterly bewitching. In early spring, the wild fields are getting their greenness, and lapwings huddle in the furrows. In this setting, church and farm are camouflaged; the grass, hawthorn and trees make a secret world amongst them. Crows and jackdaws wheel above. The grassed path leads to a little wooden porch, with a drop-gate to keep out animals. As Mortlock observes, it seems to be original, but there is nothing else like it in Suffolk. The door into the church has a metal grill set in it, and this all seems original too, 18th century at the latest. Through this grill, you can peep at remarkable things. The graveyard is still in use for burials, and what a peaceful spot this must be in which to see out eternity! It is pleasant enough to rest here if for only a moment, among the scattering of 18th and 19th century memorials, and the large Robins monument set into the outside of the south chancel wall. I was here most recently on a beautiful day in early April 2008, and I must have sat for half an hour in the sunshine. The birds didn't seem to mind such an interloper, going about their merry spring business with scarcely a glance at me. The church is usually open at weekends and during the summer, but if you are making a special trip it is really worth borrowing the key from Needham Market rectory first. Badley church has one of the most haunting and evocative interiors of any church I have ever visited. It is essentially an untouched 18th century interior, with barely a sign of Victorian enthusiasm. The benches and box pews are bleached white by centuries of Suffolk air and sunlight. The tiled floor is delightful; the whole piece is nakedly rustic. There are brasses and memorials to the Poley family, who lived in the original Hall. The only jarring note is the unexciting 19th century glass in the east window. The church fell out of use in the 1980s, and is now in the care of the Churches Conservation Trust. But it hasn't always been loved. The iconoclast William Dowsing came this way on the morning of Monday, February 5th 1644. It was the last full day of his first tour of Suffolk, and he was probably in a bad mood - certainly, he seems to have been only just realising the enormity of his task, and this was the week he appointed the brutish and scheming Thomas Denny as his deputy. Dowsing found an ally here at Badley in William Dove, the principal landowner and churchwarden. Dowsing himself broke down about half of the stained glass, but trusted Dove to get rid of the rest. He also charged him with the task of lowering of the chancel steps which had been raised by order of Archbishop Laud a decade or so before. No old glass survives, and the chancel steps were never to be made high again. Kirby's 1764 Suffolk Traveller found 82 people living in this parish, although many of these must have been down on the main road, part of which is technically within the parish boundaries. In 1844, White's Suffolk Directory showed a population increase of just one, to 83 - there were three farms, a windmill, and the wonderfully named William Mudd living in the Hall. You can find memorials to Mudds in the graveyard even today. 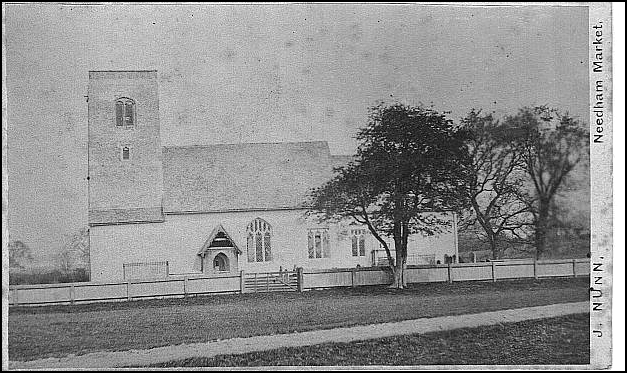 You can see what the church looked like in the 19th century from the photograph lent to the site by Nick Barmer, below. Two farms remain, although the mill is long gone. It is a curious thought, but out of all Suffolk's churches the journey here still most closely resembles that made by Dowsing and Kirby. 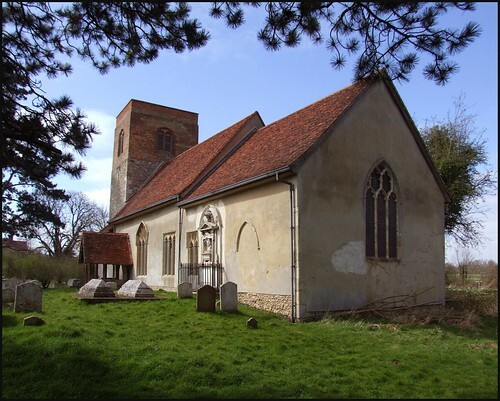 If you have come here by car, you'll need to go back along the track to Needham Market, but if you are on foot or on a bike, you can extend your journey into the past by continuing along the track west from the church. It forks here; the right fork leads into the farmyard of Badley Hall, but the left fork is a public right of way.As I stood at the fork, I remembered my first ever vist to Badley. I'd wanted to head onwards to Battisford, and so I took the left hand fork, which led me on and down further into the valley, before it began to climb again. This part of the track would have been quite impassable to any vehicle other than a tractor - I had to get off and push my bike for about a quarter of a mile between the high hawthorn hedges. Coming back in 2008, there was no change, except the track was more or less cycleable between the deep tractor ruts. Just as the lane becomes less rutted, it emerges into the farmyard of Badley Green Farm, the settlement's only other house. The footpath goes off to the right here through a gate and across a small field (the first time I came, I didn't notice this, and got a proper telling-off from the farmer for going through his farmyard). The track continues along the top of the ridge, and you can see Badley Hall and the tower of St Mary in the valley below. After about another half a mile, the track becomes metalled again, and after a hauntingly beautiful little thatched cottage, the rather mundane bungalows tell you that you have reached the hamlet of Little London. The top of Combs church peeps rather surreally over the crest of a field; you can walk to it in ten minutes from here, or take the long way round by road, about two miles. A bit further on, you fully rejoin the 21st century at the junction with the Stowmarket to Battisford road, where the busy traffic will give you cause to wonder, just for a moment, if it was all a dream.